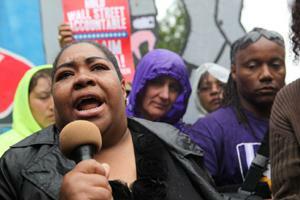 SEIU members rallied earlier this year to protest the corporate tilt in Washington’s handling of the recession. They say the cities’ budget crises are propelled by tax loopholes for the wealthy and corporations. Photo: David Sachs | SEIU. For the last 40 years anti-union business organizations and media bloviators have undermined or virtually decimated private sector unions. They are now determined to destroy unions in the public sector. Breathtaking misinformation is peddled to the public. Public sector unions are portrayed as responsible for the economic immiseration of all working people. Never mentioned is a tax structure that unfairly burdens middle and low-income taxpayers. The distinction between public sector union employees and management is conspicuously omitted. Public sector union members are not living lavish lifestyles. Like all working people, they are struggling to pay unfair tax burdens for high-quality public services: police and fire protection, schools, childcare, libraries, public works, parks and recreational facilities, roads, bridges, veterans homes, hospitals, community health centers, and city and town halls. Investment expert John Maudlin reported last October that the average federal worker earned $75,419 a year, while the average earning in the private sector was $39,751. This assertion is baffling, if not laughable. For one thing, “average” compensation has little meaning when the exorbitant salaries of managers can skew the data. The Center for Economic Policy Research (CEPR) analyzed census data in a September report. It found that state and local government workers are often older and more educated than private sector employees, but they earn 4 percent less than those with the same age and education. SEE ALSO: Who Pays Taxes? Our tax system is painfully unfair to middle- and low-income people. Laws in the majority of states are rife with dodges that permit large corporations and wealthy people to avoid paying tax.Read more. WHO CAN AFFORD A HOME? A key indication of fair compensation is the ability to afford a residence. A study this year by the Center for Housing Policy looked at more than 200 housing markets and 60 occupations. It found that police officers and elementary school teachers did not earn enough to buy a typical house in two out of five of the largest metropolitan areas. School bus drivers did not earn enough to afford rent on a standard two-bedroom apartment in those five areas. Firefighters and librarians were unable to afford the median home price in the New York, Los Angeles, and Chicago metro areas. In 2008, the ACCRA Cost of Living Index ranked Boston seventh in earnings required for a family of four. A family must earn $84,173 in Boston to equal the national average of $63,000 for basic living expenses. The salary for a first-year Boston Police patrol officer is $51,710. The hazardous night shift is $57,170. In Boston, critics have focused on anecdotes about alleged abuses by police and firefighters. The public has a right to accountability, but the overwhelming majority of police and fire union members are committed to their work. The next time gunshots reverberate or an incinerated building explodes, consider the compensation for those who answer that call. There are simply no data supporting the claim that “overpaid” teachers are responsible for underperforming schools. That is tantamount to blaming the Department of Public Works staff for increases in auto accidents. The real agenda behind this ploy is to decimate the public school system, cause costly privatization, and eliminate teachers unions. This February, 89 school teachers were dismissed in Central Falls, Rhode Island, for working in “underperforming schools.” Education Secretary Arne Duncan applauded the mass firing. Not one of the teachers terminated ever received an unsatisfactory performance evaluation. Research concludes that the causes of underperforming schools are largely family poverty, dilapidated facilities, inadequate curriculum, and overcrowded classrooms. The charge that inflated union pensions are crippling states’ economies is propaganda. What must be reined in are management pensions in some states and municipalities. For example, in Illinois, pensions for the top 100 school administrators were posted online in 2008 under a headline that barked, “Certain states are broke for one reason—Public Employee Pensions.” The pension amounts were outrageous—but the list was composed of non-union, management administrators. In California, public sector unions and their pensions have been vilified by the governor and others. The California Public Employees Retirement System compiled data from state records and showed that even with management pensions included, the average monthly benefit to California retirees is only $2,101 per month. Seventy-eight percent receive $36,000 or less per year. Less than 1 percent received pensions more than $100,000. Of the top 10 retirees, who receive six-figure packages, not one is a union member. Compare the $208,000 pension of the former president of the University of Massachusetts-Boston with city worker pensions. According to the Boston Retirement Board this year, the median pension in Boston is about $23,000 annually. For Massachusetts state employees it’s $24,000. About 30 percent of all state and local employees are excluded from collecting Social Security when they retire. The Economic Policy Institute reported this May that 180,000 local government employees have been laid off since August 2008. Concessions in the form of furloughs, wage freezes, and diminished hours have become routine for public workers across the country. Holding unions responsible for the economic burdens on middle- and low-income people is utter demagoguery. It distracts all working folks from structural economic injustice that corrodes the spiritual, moral, and ethical fiber of individuals and communities. Unions are not “special interest” groups. Corporate ideology tries to apply that tag to any organization that appears to place its interests over the common good. We are then asked to believe that corporations are really concerned with more than generating executive salaries and profits for a tiny group of shareholders. A job that offers fair compensation and retirement benefits, affordable health care, housing, and educational opportunities must not be privileges decided by the whims of the upper class. That demographic comprises only about 1 percent of the population. They, and the critics of unions, are telling all working people they must be content with the bottom rung of the economic ladder. Historically, unions have produced a prosperous middle class—that is now vanishing. Bruce T. Boccardy is president of Massachusetts SEIU Local 888, representing almost 10,000 public sector employees across Massachusetts.